The questions about gold v the Dow seem to be relentless. Here seems to be the number one question people ask. Most of the nonsense about gold are sales pitches designed to convince people to buy. They far too often are not well founded in history and when they try to rely on history they get it wrong. (1) Under a gold standard gold DECLINES with inflation it cannot rise in value or there would be no inflation. (2) During a Depression, WHATEVER the currency might be, it rises against everything else. So when it is a gold standard, gold rises when stocks and assets fall. When it is NOT a gold standard, gold rises and falls with assets. We are in a FLOATING exchange rate system where money is not gold. That means gold will rise and fall with assets on a much more correlated basis than when it is money and thus moves in the OPPOSITE direction of assets. 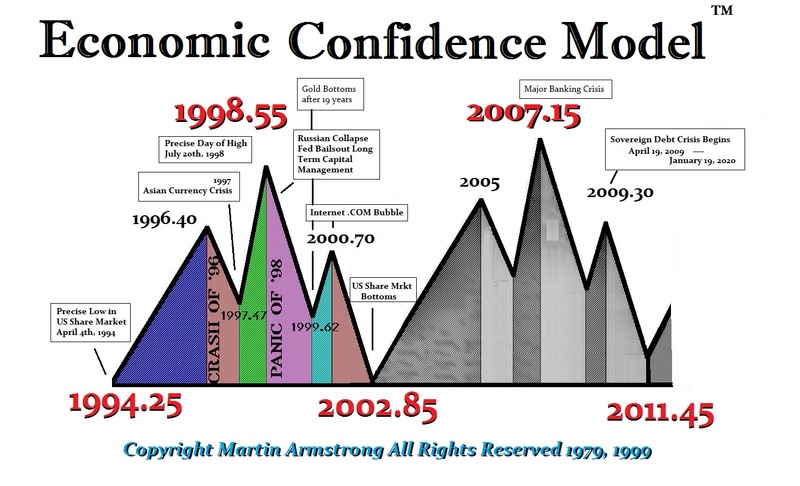 Ever since the major turning point on the Economic Confidence Model in 2002.85, gold has aligned itself more closely with the stock market because this is part of the cycle of the shift between PUBLIC and PRIVATE assets. Look at the chart below. Gold rallied strongly WITH the stock market out of 2002. It took off again with the Dow out of 2009. So just where are the two trading opposite long-term? The stock market does NOT need to crash and burn for gold to rally. They are on the same side of the fence. The primary difference is the individual can invest in gold bullion where institutions need regular income. Thus, institutions will predominantly buy shares, including mining shares, for they are audited and need to show income. They cannot sit and hold bullion keeping in their sock drawer. Based upon the questions concerning gold, it is obvious we need to issue an authoritative piece on gold that is not designed to sell you something. The ONLY way to understand the future is to proceed without predetermined biases. We are trying to survive – not prove some theory was right or wrong. The facts are the facts. We will let you know when it is ready. Obviously, the stories about hyperinflation, paper gold, bank manipulations, gold reserves filled with tungsten or vanished, and Fed monetization have filled the air. None of this means much for gold is not trading in a vacuum. We are in a trend of declining confidence in government and that is ALL that matters for all assets rise during such periods historically. As far as the dollar is concerned, yes gold & the dollar can rise together. This is NOT a domestic issue alone. We are talking about capital on a global scale. 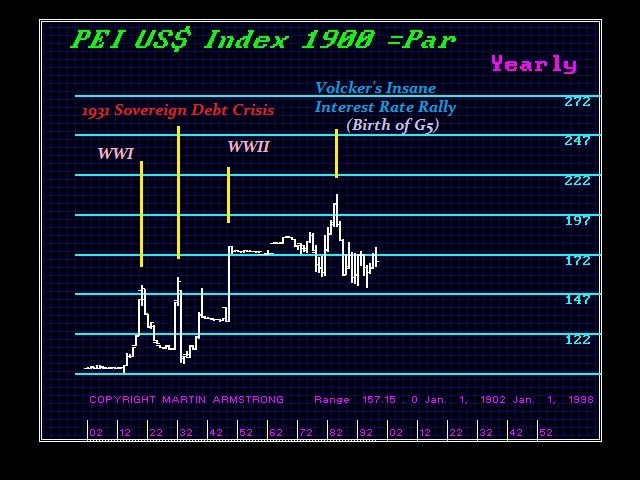 The dollar and all commodities rallied for WWI & WWII as well as the Sovereign Debt Crisis of 1931. 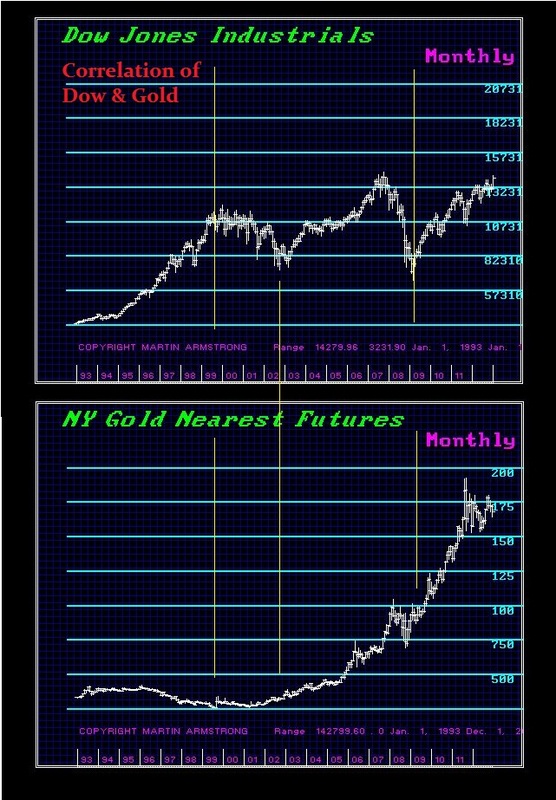 Gold declined and the dollar rallied into 1985 BECAUSE the dollar went to all time record highs thanks to Volcker taking the Discount Rate to 17% in 1981. The insanely high interest rates justified buying the dollar and government bonds as the National Debt soared thanks to interest, The Debt soared from $1 trillion in 1981 to nearly $17 trillion today. « Why do they Hate us so Much?